At SCB, the services supplied for our commercial clients include a wide range of general fulfillment and packaging handling partial or complete packaging tasks. Orders are packed following your precise specifications and we pride ourselves on fulfilling all orders with total accuracy and reliability. Examples of contracts we have completed for our commercial clients include packaging, small DIY items, fixing labels onto outer boxes or packages, counting and filling boxes with multiple components and preparing mass mailings. Throughout each assigned contract our Service Users are supported by dedicated staff. Local garden building supplier, Rowlinsons Garden Products, who supply to DIY stores and garden centers have shipped outwork to SCB since its establishment in 1998. Rowlinsons needed help in packing the correct number of components in pre-prepared packs of screws and washers to accompany their building panels, so they contacted SCB for help. This was a great opportunity for us to show that quality and accuracy in fulfilling our orders are top of our list of priorities. As a result we now regularly fulfill this client’s orders, who remain delighted with our work. We not only carry out labelling work for Crewe based Aztec Aerosols but also carry out assembly work for their products. In addition to supplying labelling work Crewe based Aztec Aerosols also outsource the assembly of caps and tubes to SCB. Each container cap needs a tube attachment, of varying sizes, inserted into the cap prior to despatch. Initially some service users struggled with the technique, but through dedicated training, encouragement, and determination it has now become one of the requested tasks to work on and Aztec Aerosols have been one of our steady clients. Over the course of a month approximately 20,000 caps and tubes are assembled and quality checked, by dedicated trainers, prior to being packed ready for despatch. Over the years SCB has carried out numerous mailshots for various customers. This can range from simply inserting a single leaflet into an envelope and applying a label, to larger jobs that involved collating several inserts into one outer piece, labeling and stamping the final mail piece. Tasks are broken down into manageable sizes and are carried out as a team. Service users often rotate around the varying tasks and elements of the process which gives variety and helps to emphasise the need to work together rather than as individuals. 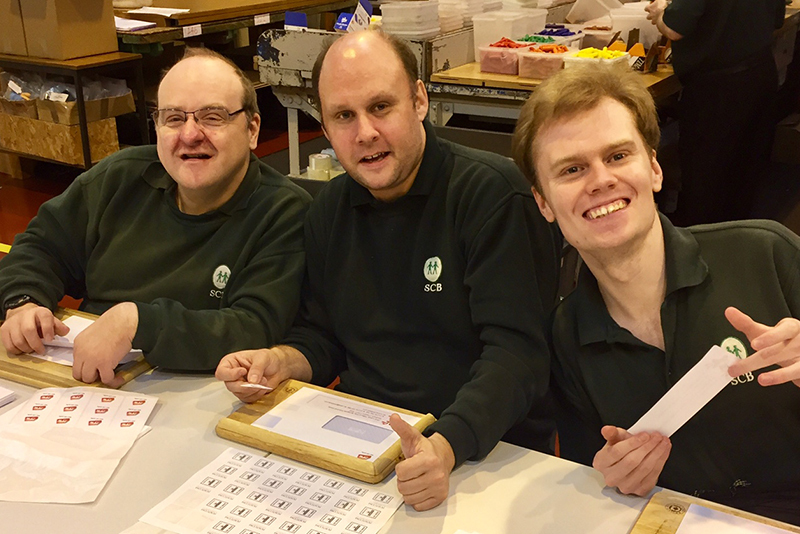 Throughout the course of the year, and to help generate funds for our ‘End of Year’ party, service users help to make Christmas card packs, which are sold to our supporters. Recycled cards are firstly sorted into size, with lettering and decoupage items being removed. Shapes and scenes are then cut from the cards, before being used for new designs on supplied card. The finished cards are bagged with envelopes in packs of six, ready to be sold. The whole process offers the chance to develop valuable skills requiring dexterity, stimulation, creativity, and creates a great opportunity to deliver a product for resale to the benefit of SCB. Based in Middlewich, Scolaquip Ltd have been working with SCB for the past thirteen years. Although the brief was initially to pack a single line of crayons, this has over the years developed into packing chalks and pencils as well as wax crayons in various quantities and formats. Having been impressed by the enthusiasm of the service users at SCB, together with the robust quality control measures in place and the high level of customer service offered, we’re delighted to say that the volume of work from this satisfied client has been steadily rising. Crewe Orlando have been working with SCB for several years and are one of our loyal clients. In addition to the packing and labeling of hair grips, in varying quantities, we also pack some of their other products (brushes / dryers / capes / hair bobbles) aimed at the hairdressing and beauty salon industries. The Salt Company, based near Nantwich, has been a long-time supporter of SCB and has supplied a steady level of projects since the workshop’s outset. Over the course of the association, we have been delighted to undertake a wide range of packaging work including: applying lot numbers to table salt canisters, applying batch codes to a variety of product labels, and the labelling of salt tubs, canisters, and packing boxes. Many service users view working on salt tubs, and associated items, as their favourite task and all, without exception, are able to do at least one aspect of the work associated with the tasks supplied. We can also apply paper labels to many products, using glue sticks. One client: Aztec Aerosols, asked us to apply paper labels using glue to varying sizes of cans and bottles. Accuracy is paramount with this task as glue is applied to the edges of the label, before being wrapped around the container, ensuring the label remains aligned. After being quality checked by dedicated trainers, to precise requirements, the cans/bottles are repacked ready for despatch.